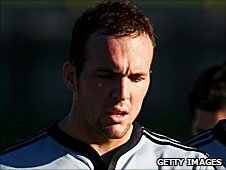 London Irish have signed All Blacks second row Bryn Evans from Super Rugby outfit Hurricanes. The 26-year-old lock, who also plays for Hawke's Bay in New Zealand's domestic provincial competition, has signed a two-year deal. "I am looking forward to testing myself against a different opposition in a different club competition," he said. "The chance to play in the Heineken Cup against the best teams in Europe is also a very exciting prospect." Evans has been capped twice by New Zealand, both against France in 2009. He played for the Blues in the 2008 Super 14 before moving to Hurricanes. Exiles head coach Toby Booth added: "Bryn is a huge addition to our squad for next season. His physical presence and his capabilities around the field will hold us in good stead for the 2011/12 campaign. "The experiences Bryn will bring from playing for the Hurricanes and All Blacks will no doubt rub off on the young players we have coming through in the second row position."